Close your eyes and imagine yourself in beautiful coastal San Simeon, CA - the coastal breezes wafting through flowers and the soft glow of sun kissed beaches. San Simeon wrought iron window boxes add luxurious charm and are outdoor heavy-duty planters for your window or balcony garden. Each window box is constructed from hammered steel that is hand bent into decorative scrollwork that transforms this standard window box into some serious curb appeal! 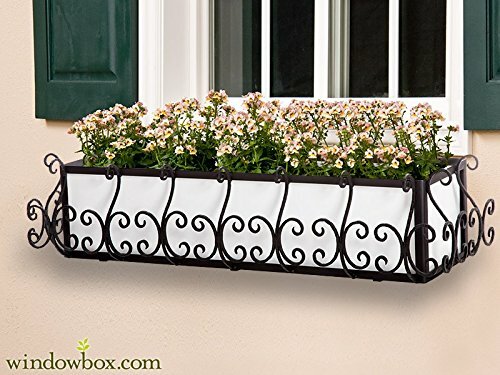 Use wrought iron window boxes under front or backyard windows - or, purchase railing brackets separately and for use as railing planters for herbs and plants. Each iron cage is powder coated in your choice of matte black or textured bronze. The powder coating helps repel rust and protect the metal planter against the elements. You can add a metal or pvc window box liner. You can also opt out and order the window box cage only; fits 8"Dia. Pots.Each of our black wrought iron window boxes is constructed with a sturdy mounting strip that runs nearly the entire length of the cage. This allows for hardware placement that's specific to your stud spacing, and guarantees a secure, easy way to mount your flower box. Bolts & screws are sold separately along with decorative brackets.